Open banking brings both the opportunities and challenges to banks all over the world. Due to the different economic development levels of each country and the gaps among financial environment maturity, all countries have different strategies and regulations towards the privacy protection of data in financial scenes, such as the General Data Protection Regulation (GDPR) by European Union (EU). In this context, each financial company (such as banks) should meet the balance with data privacy sharing and financial application development in an open format. A blockchain as a continuously growing list of records managed by a peer-to-peer network is widely used in various application scenarios, and can protect the privacy of financial data. However, financial blockchain still poses some problems that cannot fully meet the data protection needs. Big data technology is widely used in the traditional financial environment, and it should consider the open formatted big data application. In this talk, I will discuss some opportunities and challenges for the big data and blockchain research community in the context of the new open banking applications. 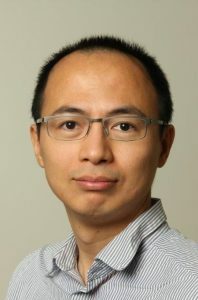 Hao Wang is an associate professor and the head of Big Data Lab at the Department of ICT and Natural Sciences in Norwegian University of Science & Technology, Norway. He has worked as a researcher in IBM Canada, McMaster, and St. Francis Xavier University before he moved to Norway. He received a Ph.D. degree in 2006 and a B.Eng. degree in 2000, both in computer science and engineering. His research interests include big data analytics, industrial internet of things, high performance computing, safety-critical systems, and communication security. He has published 80+ papers in international journals and conferences such as IEEE RBME, TVT, JBHI, Design & Test, Elsevier FGCS and Computer Communications. He served as a TPC co-chair for IEEE DataCom 2015, IEEE CIT 2017, ES 2017 and reviewers for journals such as IEEE TKDE, TII, TBD, TETC, T-IFS, IoTJ, and ACM TOMM. He is a member of IEEE IES Technical Committee on Industrial Informatics. His webpage is www.haowang.no.